Build to a challenging set or two on each exercise. *5 Lateral Bar Burpees EMOM, beginning at 3, 2, 1, go. Join Us for the CFSBK Community Potluck This Saturday! This year’s Community Potluck goes down this Saturday, February 9th! We’re excited to get everyone in house to break bacon and socialize together outside of classes. This event will simultaneously kick off the new year, support the Look, Feel, Perform Better Challenge, and bring folks from all times and corners of the gym together. The fun starts at 7pm and will continue until around 10. This event is open to everyone and all are encouraged to come. Bring your friends and family! 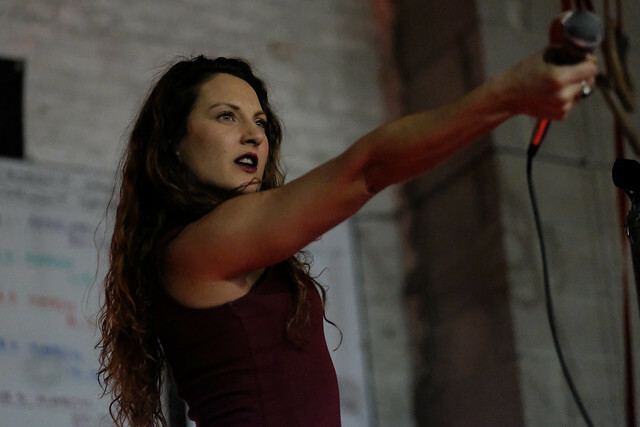 8:30pm: Awards and screening of documentary short on Fight Gone Bad 2018! Everyone is encouraged to fill out a voting sheet for their favorite side dish, salad, entree (separate awards for vegetarian and non-vegetarian options), and dessert. Voting will focus on both the taste and healthiness of the dish. You may remember a film crew at our Fight Gone Bad event this past fall. Well, they finished their short film, and we’ll be screening it at the Potluck! Come get involved and meet new people! We need a few volunteers to direct people as they come in the front door, help arrange food as dishes are placed on the tables, and MC the karaoke. Please contact Coach Brett at Brett [at] crossfitsouthbrooklyn.com at the email address above if you are available to help even for a short time during the evening! Shoulder Taps: Happened – got better at pointing toes and keeping things tight. Fun discovery of the tan tape on the new 18kg KB. 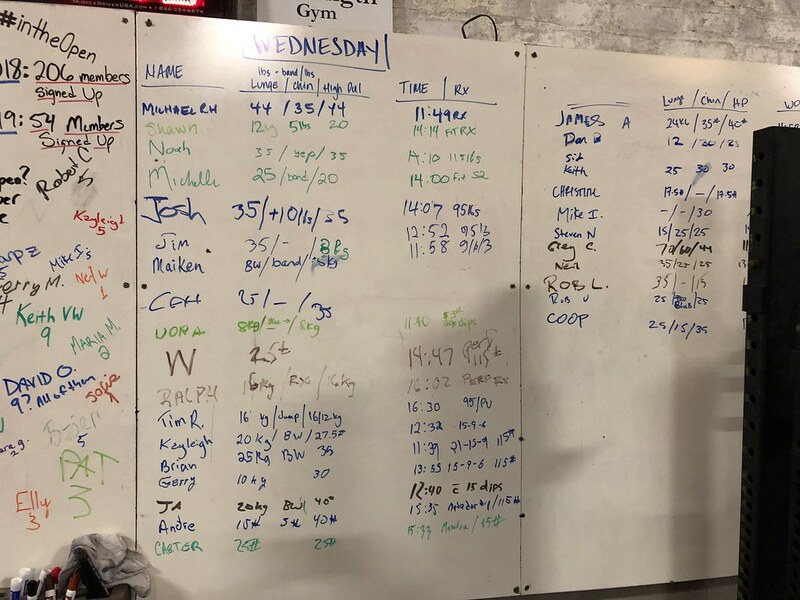 Someone is going to be very disappointed when they go for a yellow during the WOD and realize they are scaling up (or vice versa with the white). WOD: 41 Rx. Started with a big set of 11 (6-5), then basically 4 (2-2) every time with a little variation. The burpees caught up to me way more than I expected. HOWEVUH. It’s quite a lot of homework! Fortunately today I happen to be working from home so it was OK that I didn’t finish this until 8:35 AM, but in the future I’m going to have to get to SBK considerably before 7 AM to get it all done. 1B) Front squat, 5×3 80%+: did these at 153, which is more like 75%. See above. 2A) Clean liftoff (1st pull), 5×2 at 105% of clean 1RM: did these at 133. The weight is so light that I had to force myself to focus hard on what I’m actually doing this for: to ingrain the habit of moving my knees back during the first pull. 2B) Clean deadlift from 6″ block, 3RM: worked up to 223. I can manage more as far as leg strength, but BOY was my grip fried. 3) Strict press, 5RM: worked to 78, a little room to grow here. 4) Bench press, 5RM: gahhhhh! I think I was supposed to do 6s, not 5s! Oh well. Worked to 123. Good to know I’ve still got a moderately hard set of 5 at that weight even though I’ve lost so much weight since the last time I benched regularly. 5) Barbell row, 50 reps: 63, accumulated these in 2 sets of 15 and 2 sets of 10. 6) Pullups, 30 reps: Mostly singles; I’m going to ask Frankie whether the intended stimulus is really more about doing bigger sets, in which case I’ll use a band next time around. -4 sets of CLRDL’s at 8k (yay new KB). I can not keep my hips square at all while doing the left side. awful. -3 sets of rows @ 35#. Wod= 32 reps at 95#. I was hoping for all the burpess under 15 secs, which I made save the last round. Initial plan was 5 per round and then I was kicked in the face, ended up: 5/4/5/4/4/4/2/4. Almost quit. Burst out laughing a few times. Needed savasana after, so pretty much a yoga class for me. Back in the 212! Haven’t done THE SPORT OF FITNESS for many days, and it shows. Rows up to 80lbs – I love the new DBs, now I don’t need to jump from 50lb to 75ls. I knew the burpees would get to me, I originally had a game plan of 3-4 per round, started the first round with 5, then went completely downhill from there. Ended up doing 5/4/3/2/0/4/0/5. Had some serious thoughts of just stopping in the middle. Uff. 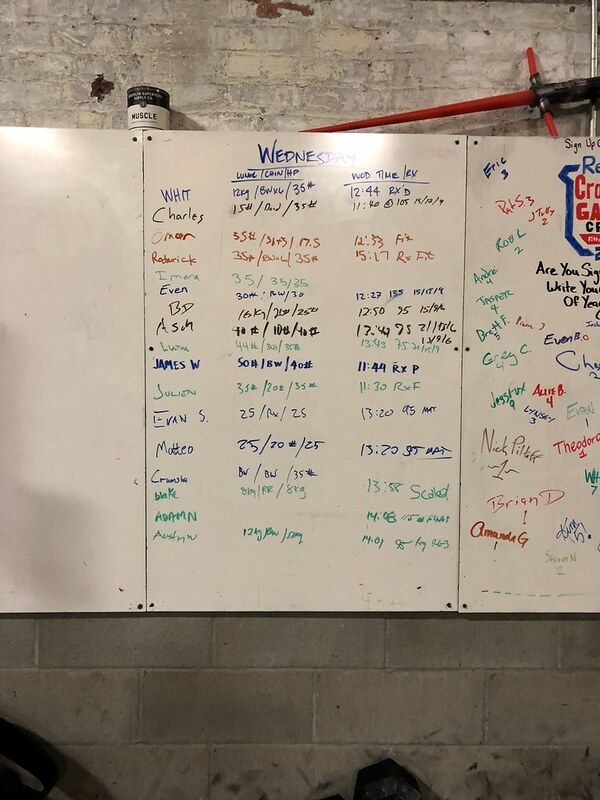 About crossfit in NOLA, I second the recommendation for CrossfitNOLA at the 504 Cortez location. Katie’s description is spot on. There are other gyms closer to the French Quarter but this is the best. If you are in town, call ahead before signing up for drop-ins online. They usually offer a discount for the first class and weekly passes at a lower rate. Also, when they say a workout is “spicy” take their word for it because Cajun spice is no joke. Noted! Thanks for the intel! Wasn’t planning to workout today, but found myself with the time, so 6:30 class happened! NFT work felt good, but challenging. 35# row, 12kg on single leg stuff (wobbly on right), shoulder taps felt pretty easy! I keep thinking I coulda had a plan for this but probably not. Had several sets of 2 in there which wasn’t great. Legs felt way too cold from the start. I had a really amazing training day. I needed this. Is there some sort of performance enhancing substance in the water today? seriously, i was on the juice today! Wish I could feel like this more often! I cant believe that happened!!! that was facking awesome. When i hit the last rep at 155 I sort of yelped, growled, and celebrated at the same time. Coach Nick claimed there were 50 shades of emotions. its all on video too. perfect. It felt like cheating it was so much easier! Loved it. Seems a bit higher to the ground too which helps. After looking at the video of the bar speed i could have gone heavier. sweet! Hate to say it but i wouldnt be disappointed with a repeat of 18.1! I dont think it will happen. HELLLLS yeah all those negatives have helped!